This week we sent 100 tents, blankets and food, together with 8 volunteers to Paris to help Danika Jurisic and over 1000 refugees who are living on the streets. They were in a bad way due to constant rain and no shelter and there were many new arrivals with nothing more than the clothes on their backs. ‘Hi can you help me brother? I have just arrived yesterday from Italy. I want to live in France, I want to seek asylum here, I have nowhere to sleep, I have eaten very little, there’s so many people here, can you please help me, I feel so lost? I want to study, I have qualifications, where do I go, what do I do?” The situation has become very desperate for many refugees in Paris. A man from Sudan spoke to one of our volunteers about how confused, afraid and dejected he felt amongst approximately 600 other refugees who are settling in and around a park called Eole in the north of Paris. Most of them are looking to settle in France but the procedure for them to get fingerprinted at the FTDA centre has become a very long and tedious waiting game. Close to a hundred people wait outside for days upon end in front of the ‘FTDA’ resting on mattresses and floors, whilst the the city passes by in indifference. With new arrivals entering Paris, including children, some sleep in tents, but most are homeless, without much food, and are either sleeping underneath tarpaulin or in sleeping bags and blankets on concrete floors. Because there are no washing facilities and only three portaloo toilets there has been an outbreak in skin conditions. There are individual volunteers from Paris coming to help, but with the increase in new arrivals there are not enough volunteers to help and accommodate the needs of many with tensions , stress and pressures rising. With resources at our warehouse in short supply, we desperately need your help now more then ever. As well as supporting refugees in Calais we are working with volunteers across other parts of northern France in smaller camps and with families who have just arrived in France. 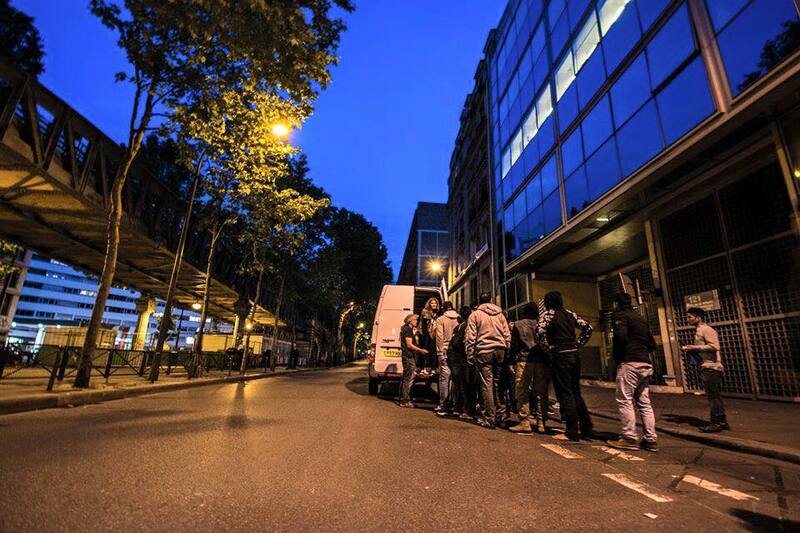 Last week we drove to Lille to give out food, clothes and basic necessities. We covered 40 people men, women and children who have just been granted refugee status.